On this day the first player to integrate the woeful St. Louis Browns, Willard Brown hit an inside the park home run off Hall of Famer Hal Newhouser to propel the Brownies to victory, 6-5. It was a pinch hit home run in the bottom of the 8th that gave the Brownies a rare, late-inning, game-winning home run. This is important because with this home run, Willard Brown became the first African-American in the American League to hit a home run. Unfortunately it was this Hall of Famer’s only big league home run. Sadly, it is one of baseball’s greatest catastrophes that Willard played in only 21 major league games. Thankfully his excellent play was recognized as he was elected into the Baseball Hall of Fame in 2006. He also played on the one of the few integrated US Army teams during WWII. As part of the D-Day invasion, Brown was recruited to play for the OISE nine. This team, with Browns play, won the ETO (European Theatre of Operations) World Series Crown. These games were played in Nurnberg and Rheims in the fall of 1945. 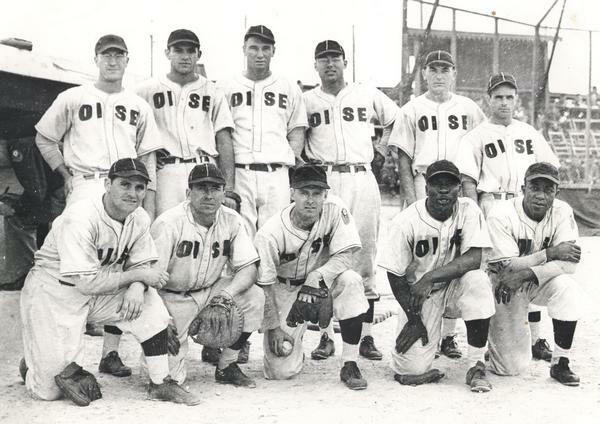 OISE All-Stars ETO World Series Champions in 1945. Willard Brown is front row, fourth from left. On July 17, 1947, Hank Thompson and Willard Brown were acquired from the Kansas City Monarchs, for a reported $5000 each during the season and became the second and third men to integrate the American League. Due to racist attitudes and poor quality of the organization, and perhaps even a move to not pay the Monarchs extra money, both Thompson and Brown lasted just one month in St. Louis. Hank Thompson was later picked up by the Giants, and thus became the only man to integrate two teams. Later Willard left the team because he felt that the Monarchs were a better team and organization, and additionally, the lowly Brownies could not beat their Kansas City neighbors. It is one of baseball’s tragedies. He used a borrowed 40 oz. bat that had lost its knob. Rory Costello, in his SABR Bio Project on Brown, writes, “the aftermath of that homer has become more memorable.” Brown had borrowed the bat from Jeff Heath, perhaps the most superstitious person in the clubhouse. While Health was commended by Hank Thompson for going out of their way to welcome Brown and Thompson into the St. Louis club, he did not to share his bats with anyone. After the home run, Heath smashed the bat against the dugout wall. It was suspected that Heath did so because Brown had used up one the bat’s home runs and the bat was worthless. Willard finished up his playing days in the old Texas league hitting .307 and 91 home runs then the AA league for the majors.